American Sniper is the biography of the most lethal sniper in the United States military, who was apart of the United States Navy SEALs. 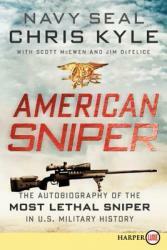 The biography encompasses the story of Chris Kyle, to which it describes the story of both his military tours and his own personal/civilian life. 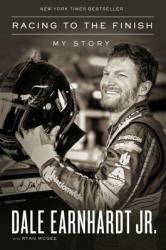 This autobiography adheres towards the intriguing events that Kyle experienced within his life. American Sniper was a very well written book that did a great job describing the embellishments and challenges that Kyle faced, when he was a SEAL or just a civilian. 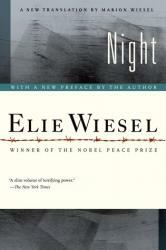 Personally, the book is one of the best that surpasses many other titles that I have read. I highly recommend it to other readers. 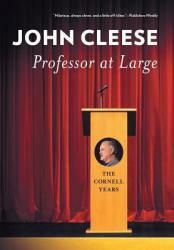 As a John Cleese fan, it was fun to be able to learn of another of his endeavors - serving as a Professor at Large at Cornell for 10 years! The texts in the book are a collection of some of his lectures over the years. They, of course, elaborate on many of his performance experiences but they also provide a broader view of his other interests. All the Monty Python group are intelligent and creative, so it is no surprise that Cleese's intellect has been engaged on many fronts over the years. He is also much like his character in comedy in not suffering fools gladly or otherwise. I was pleased to note that he became quite involved in many different schools of learning while on the Cornell campus, and contributed to the thinking of both students and staff. There is some repetition of topic, but as the student body would experience a turnover over the years, I would expect that important topics would emerge again anyway. This was a fun and informative read. Since it was a series of lectures, it was easy to pick up and put down without losing the gist of things. 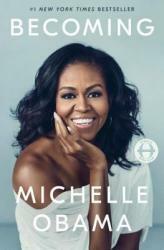 In Becoming, former First Lady Michelle Obama shares the journey of her humble roots growing up in the South Side of Chicago to becoming First Lady of the United States. The book paints a picture of a woman who has struggled with the question "Am I good enough?" for much of her life, but has persevered through her doubts. It also gives a picture of Barack Obama's political aspirations and rise to the Presidency. Even for those who disagree with Obama's politics, the book depicts the portrait of a man who entered politics because he truly desired and believed he could make the US a better place to live, and shows both Barack & Michelle Obama's commitment to public service. In that sense, it prompts the reader to stop & consider, what are my core values, and what am I fighting for to make the world a better place? It's an inspiring read when considered through this lens. 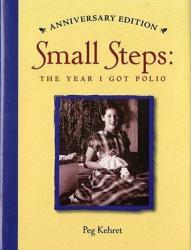 "Small Steps: The Year I Got Polio" by Peg Kehret is an interesting autobiography that gives insight to what people with Polio experienced. The main character, Peg, faints one day during school and has a high temperature so she is taken to the hospital. There she is diagnosed with Polio. This news is devastating to Peg and her family but Peg's family decides to stay positive while Peg is sad. Throughout her journey Peg gets better with the support of her parents. I would recommend this book. "Small Steps: The Year I Got Polio" is sad but also heartwarming at times. I read this book because it is a battle book. I couldn't relate to any of the characters, however the emotions Peg felt could be related to a lot of other people. The book isn't predictable at all. It is not the best book I have read this year but I would still recommend this book as it is still good. The true story "Chinese Cinderella" is about a young Chinese girl named Adeline who faces the struggles of being unwanted and unloved. Adeline is seen as bad luck because her mother died after she was born. Her stepmother, Niang, hates her and favors all other siblings besides Adeline. Adeline achieves academic awards and good grades in hopes to make her family proud however they still see her as nothing. 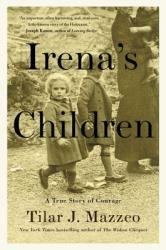 Throughout the book she faces many different problems all relating to her family mistreating her. Adeline is even sent to an orphanage at one point due to her friends coming to her house to throw a party for her. Not only does she face physical issues, but Adeline faces mental and emotional issues. Despite these issues, Adeline stays strong until the end and continues to try her best. I read this book for a book report and was not at all disappointed. "Chinese Cinderella" was sad but heartwarming. During multiple points in the book I cried. Adeline's feelings are very relatable and real. I thoroughly enjoyed the book. 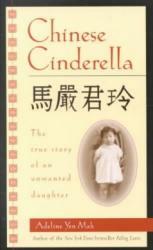 "Chinese Cinderella" is in a genre of books I do not generally read however I was surprised and actually liked it. It is one of the best books I have read this year; I would definitely recommend it. with figuring out how you fit in? 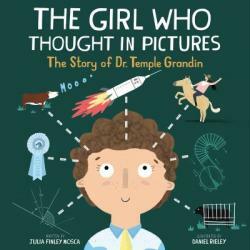 If so, read the story of Temple Grandin. world. This biography, set it rhyme, encourages all to STAND TALL. This review is really about a spread of books I found or was able to access through PPLD. After an enjoyable visit to Skagway, AK, I became interested in Klondike Gold Rush history. 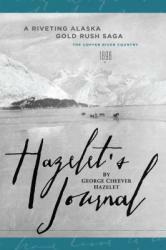 Through the PPLD catalog and an interlibrary loan I accessed: Hazelet's Journal by George Cheever Hazelet: If you enjoy history from original sources, this book will draw you in as the author writes honestly about a business failure that led him to seek gold in Alaska. The arduous travels searching for gold are documented both by journal and amazing photographs. It is a slow read for someone who enjoys more of a "story." Although Cheever fails in the gold rush, as well, the stage was set for eventual successes that were instrumental in Alaska frontier development. Journey (fiction) by James Michener: A quick read that will be more enjoyable to the reader looking for a story within the historical background of the gold rush. Four Englishmen and an Irishman push their way across Canada to Dawson City, fulfilling the image of the phrase "Mad dogs and Englishmen." Gold! The Klondike Adventure by Delia Ray: Young Adult book that provides an easy-to-read purview with photographs of the rush, perils, commercialism, and subculture that arose between Skagway and Dawson City. Prospectors and merchants alike sought riches on the Alaskan frontier within a very short timeframe: 1897-1900. Klondike Fever by Pierre Berton: Subtitled The Life and Death of the Last Great Gold Rush, this book provides an exhaustive and interesting read about the gold rush from many different angles. This book was accessed through an interlibrary loan. However, the book was so old it was not pleasant to read so I am hoping PPLD will purchase a new edition. It is a very good book!